Sometimes my mind works in strange, roundabout ways. Take the latest Woot Derby challenge, to create a design in one of four artistic styles, one of which was pointillism. Pointillism is a technique where a picture is formed from a multitude of colored dots. Under magnification, all you would see is dots. Stand back, and they seem to magically herd themselves into a wondrous image of subtle colors. An outgrowth of Impressionism, one of the pioneers in this technique was Georges Seurat. 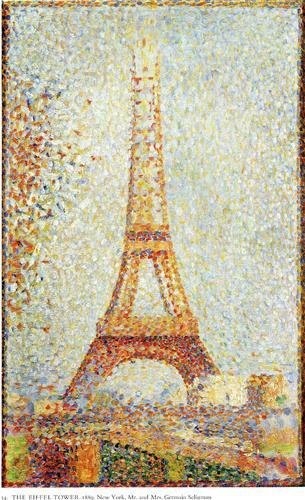 For inspiration, I looked at his paintings, and was drawn to this one of the Eiffel Tower. I thought about how I could use the technique and emulate this picture, but put a different spin on it. Square dots instead of round ones? Somehow that led to blocks, then Tetris blocks which could be used to build a structure and THEN... make the Tetris blocks out of dots. Yes, that would be interesting. I didn't want to merely throw the Tetris shapes together like a puzzle; I wanted to be sure that if they were constructed in the course of a game, that the arrangement was viable. I started by making the shapes and constructing a tower by copying, pasting, arranging and rearranging. At first I thought I'd have just the tower and perhaps a pile of discarded pieces off to the side. But that didn't satisfy me, so I looked again at Seurat's painting and played around with adding the bridge and the tree to the side. The constant copy, paste and transform actions got old very quickly, especially considering that each paste created a new layer and it was difficult to keep track of which was which. So I printed out page full of blocks, cut them out, and played with them at the kitchen table for a while. Once I had a bridge and basic tree, I returned to pasting it together in Photoshop. The next step was to "trace" the design using only dots. I did use the "snap to guides" feature to keep the outlines of all the blocks straight and orderly. And since I was using only cyan, magenta, yellow, black and white, I played around with combinations of dots in varying densities to get the color shades I wanted. Here are some close-ups, the second showing green, orange, purple and dark blue (clockwise from upper right). I’ve titled it “Not Playing to Win” since creating such a configuration in Tetris (if one were fortunate enough to get the right pieces and know where to place them) would quickly lead to the loss of the game. Still, I imagine it would be worth it and that reflects my attitude about the designs I create for the derby. This design will be up for voting on the Woot Derby now through October 16, 2014 at noon Central Time. If you've ever purchased anything at all from Woot.com, you are eligible to vote. Thank you for your support and be sure to check out all the wonderful designs... I'm sure there will be some excellent artwork on display this week.